So I downloaded the lists into Sky Safari, and they are going to work out very well. When you go to search, you scroll down to the custom lists to access the Sharpless sky lists. The objects are only searchable if they are visible, and you can center the one you want on the screen. At that point you can either star hop or use goto, if you are connected to a goto scope or Sky Commander, and once you have observed you can check each object off as observed, just like with all other observing lists in Sky Safari. Man, I have wayyyy underutilized this program! As someone mentioned earlier, I never thought that I would have any use for a map of Sharpless objects for backyard observing. Funny thing.. I did not even know that there was such a Nebula pair "The Heart and Soul." none of my other charts or sky atlas resources ever showed it, including Starry Night Pro. In fact, most of my resources did not mention many of the the nebula that people had mentioned they had seen. I found most of them in SkySafari though.. LOL. I did not even know that there was such a Nebula pair "The Heart and Soul." Great shot! Yeah, that's kind of the way it was for me. Same with the Flaming Star Nebula; I never knew it existed! BTW, there's a question that I meant to ask earlier. There has been an ongoing thread on the Reflectors forum regarding the ability to see Einstein's Cross in a telescope small enough to observe with both feet on the ground. Has anyone tried for this object using NV in any size telescope? If so, were there any successes? I'm just curious about this. Since Pegasus is now rather low by the time I can get out at night, I do not believe that it would be possible to try until next year, but I have my doubts that I would catch it in an 11" scope. Thanks for shining a green light on something new to me. What a fantastic picture. I can see them easily from my light polluted sky with a filter, but I can't get anything close to this detail. I am going to drive out to California in April and am looking forward to observing from the deep desert. I might also make a trip before then out to Mc Donald observatory. Hoping to have White Phosphor binocular before I go to CA. For some reason, I have my doubts that it will come in time, but fingers crossed. Your night trek images are always a delight to see. For those that are not familiar with Heart and Soul, slightly to the left and slightly below the Heart and Soul, you can see a little thin line of stars going from about 10 o'clock to 4 o'Clock. This is a bright string of stars that passes though the Double Cluster that most people using traditional telescopes will never see because it is to big to fit into the field. The little splotches just above and on the line are the double clusters themselves. I think the bright star at upper left is Mirfak. 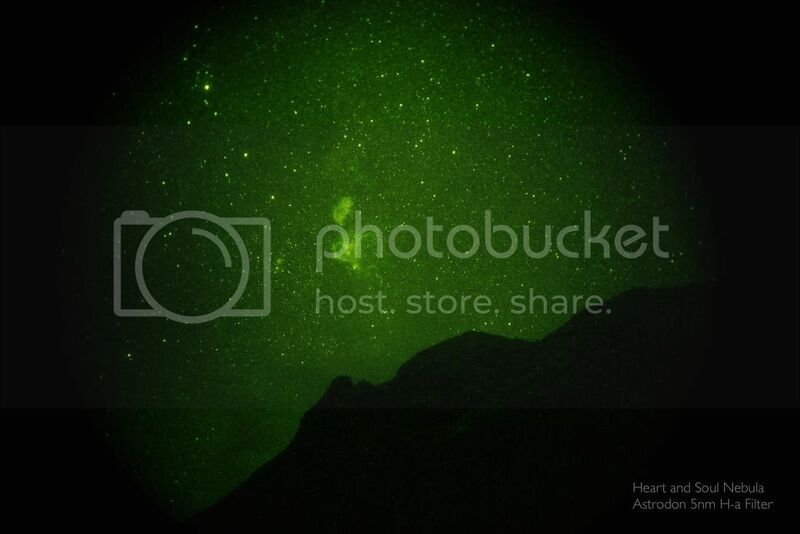 I mention this because people that have never used night vision or that have never even realized these nebula existed can't easily appreciate how big they are. This was a major revelation for me. Many of these nebula are surprisingly large. No wonder I could never see the North American nebula in my telescopes. It is far to large to be seen inside the field of most telescopes with sufficient border to frame it. More remarkable is the fact that there is another big nebular complex around Gamma Cygni that can only really be seen in the same field of view from most places using night vision gear. If Cnoct gives permission, I will download his image and annotate it so people can see what is what in the picture. When viewing with night vision, the sky is filthy with stars and I think that knowing what is in the field might be interesting from a scale perspective. Edited by Eddgie, 12 February 2016 - 02:16 PM. It is really surprising how large some of these nebulae are. The California Nebula looks pretty large at 1x with an Ha filter, and it almost fills the fov in a 3x magnifier. In my 11" dob with the PVS-7 I could only see part of the nebula filling the fov, and had to sweep around to take it all in. I can't wait to dive into Sagittarius. Look for details in the nebulae with your dob. Like with visual observing, details sometimes have to be teased out, or seen with averted vision. Yep, that's exactly what I was doing. With the 3x magnifier I could see some filaments in the nebula, but with the 11" dob, I was well inside the nebula. In fact, I had to pull back to the edge of the nebulosity just to check my bearings, then push back inward to start looking for more detail because it just fills the 40° fov. It can be pretty disorienting if you start out deep within the nebula. I need to spend a bit more time doing this, as that first night I just kept returning to the Horse Head over and over. .... Filthy with stars.... ;-) nice catchphrase! I need to spend a bit more time doing this, as that first night I just kept returning to the Horse Head over and over. There is a lot of detail to see (Orion in the dob was, according to the assistant astronomer, like looking through the Hubble space telescopes. What I like about 1x and 3x is the scale. Big stuff! And then there is Barnard's Loop. I never thought I would see it. When I did the first time, on a less than normal hazy night from my light polluted front yard, I only saw maybe 1/4th of the lenght and it was the bright area east of the belt. The first time I saw it under Mag 5 skies, I giggled like a kid. How freaking BIG!!! I can't wait to dive into Sagittarius. It will blow your mind. Pretty staggering. I was at Placid in the fall and even with dark adapted eyes, The Sagittarius area was a soft glow, and to be very fair about it, even with dark adapted eyes, there was a considerable amount of detail visible. Then I fired up and WOW! It was like looking at a green and white high resolution wall poster of the center of the Milky Way! It is a veritable cosmic zoo of celestial creatures great and small superimposed on a green river of stars. I promise you that if you get to even Mag 5 skies, it will be nothing short of breathtaking. When I first saw Cnoct's videos of this area on Youtube I thought that if I could get a view half that good I would be happy, but at the eyepeice, the view was even better. You will love it love it love it. I live under mag 5.5 or so skies, at least while it lasts, so this summer should be fun! Hey all, I was wondering where you guys purchased your ENVIS lenses? I have a micro with a few cmount lenses but would like to try ENVIS. I bought mine at Night Vision Depot for $117, shipped. RAF Camara sells a 1.25" filter adapters. RAF Camera has them. I also love the 3x clip-on lens with the Micro. I consider my Micro and 3x clip on lens and an H-a filter to be the best Grab and Go astronomy instrument I have ever owned by several orders of magnitude. If you get the ENVIS, make sure you get the filter adapter and I highly recommend the clip on 3x magnifier. In fact, I would recommend two filter adatpers from RAF and here is why. You can leave one mounted to the ENVIS. I designed it to have a very low porfile so that the Clip-on lens would still snap into position with the ring in place. I actually use the other one on the clip on connector itself (well, I have 4 adatper rings). If I am doing low power nebula sweeping and I want to go back and forth between the filter and unfitlered views, I unscrew the clip on connector from the afocal lens and mount the filter ring in it. Now, I can screw the filter on to the clip on connector and rather than have to tread and unthread it to get use the filter, I can just snap the filter on and off. I am looking for some extra clip on connectors so I can have multiple filters ready to snap on and off. Pic shows the clip on connector removed from the 3x with the filter mounted on to the connector itself. This trick only works for 1x, but screwing a filter on and off, on and off, on and off, gets tedious especially on a cold night. Snapping a filter on and off is easy even with heavy gloves. Edited by Eddgie, 14 February 2016 - 10:07 AM. Night Vision Depot has had them in stock. You will have to call them because it does not show on their web page. Yeah, $95 + around $22 for shipping. I have found that these NV dealers charge pretty excessive shipping fees. Nightline charged me $30 shipping on a $50 c mount adapter for the PVS-7. I took that down when I say you had already answered. I may buy another one though. 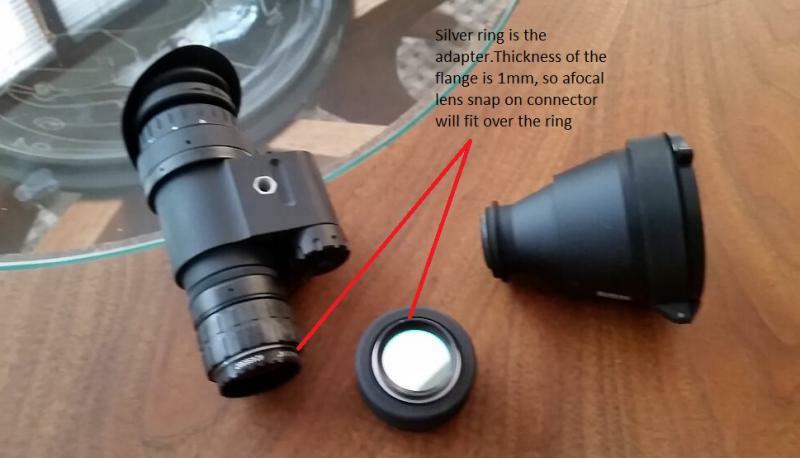 I am going back and forth on keeping the Micro, and if I do, I want to make sure I have a third ENVIS lens (I will need the two I have for the Mod 3 binocular). I am afraid that they may run out. I don't think these are being made anymore. Hmmmm, I have thought about buying another ENVIS objective just in case they go out of production. Might be a good insurance policy. BTW, that is a brilliant idea using the filter adapter in the clip on connector! I am off to RAF to order another adapter. Edited by Doug Culbertson, 14 February 2016 - 11:56 AM. I had been told that ENVIS lenses have been out of production for some time. When I was looking, someone gave me the name of a vendor that had as batch, but when I contacted them, they said that they sold the entire remaining stock to Night Vision Depot. Now maybe there are some other ones out there, but I would think that NV Depot could get them from the OEM if they were still being manufactured. But that is just my thinking and means zero in the real world because I am often wrong about things like this. I called several people looking for them though and this is the way the trail eventually got me to NV depot. Also this. I am working with Jason at Ident Marking on the Mod 3 Binocular and he is going to be an integrator on getting the tubes and getting the Mod 3 with C mount interface from AB Nightvision. In my call with Jason, he even suggested that he might order a small batch of Mod 3 C mount bodies in anticipation of future orders for Mod 3s configured this way. Now of all the people out there on the planet that might be interested in a binocular with C mount interface, 99% of them would probably be amateur astronomers, but if the Mod 3 pod with C mount becomes a popular item, then demand for the demand for ENVIS lenses from the amateur community will double (Vs people that might just go with the Micro). I also suggested this to him.. That the Mod 3 pod could be sold by itself and people could then build up to a binocular by addding the other pod and bridge later on. Anyway, most people have no use for C mount, but we do, and if you think that one day you will want to go to a true binocular and you have two ENVIS lenses, then you will not have to buy them later, and you won't have to worry about availability. That is why I am considering buying another ENVIS. If I keep the Micro (and I might) then I want too have an ENVIS lens for it, but I need the two ENVIS lenses I have now for the Mod 3 binocular. Maybe there is another source of ENVIS enses, but since the devices they were made for are long out of production, my guess is that demand will be to small to get whoever made them to make more of them. Even a $122, having one now might prevent a lot of looking later. Of course maybe NVDepot has hundreds of these things. How do you ever really know? I guess you could ask them. I would think they would make them an option on the Micro though. For astro-use, it would be a slam dunk that they could add $100 to the price and get it. Edited by Eddgie, 14 February 2016 - 12:06 PM.